Welsh Labour leadership candidate Carwyn Jones has pledged to increase education spending to combat child poverty as he launched his manifesto. Mr Jones described education as "the route out of poverty". Meanwhile Edwina Hart, a rival, said firms seeking government grants should sign up "for the long term" and make work practice and training commitments. The third candidate, Huw Lewis, said a "new relationship" was needed between business, unions and education leaders. 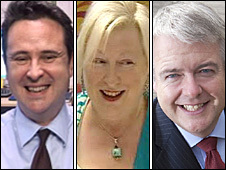 The result of the contest will be announced on 1 December, and the winner will replace Rhodri Morgan as both leader of Welsh Labour and first minister in the assembly. Ballot papers for the contest have now been sent out. Speaking at the Chapter Arts Centre in Cardiff, Mr Jones said: "My government would look to increase education spending by at least 1% above the block grant we receive from the UK government, to ensure the best outcomes for Welsh children, with a sharp focus on inequalities in education," he said. Mr Jones, counsel general in the assembly government, promised to ensure a bigger proportion of education spending reached the schools, colleges and universities for which it was intended. He stressed he was focused "firmly on the issues that matter to ordinary people". These, he said, were "public services, jobs and apprenticeships, manufacturing, our environment, housing, improving healthcare, policies for Wales's children such as affordable childcare and school building improvements, and measures to support older people, with a review of residential care". Mr Jones said his top priorities were the economy and climate change. The manifesto says his economic strategy is to "focus on growing well-paid jobs, providing apprenticeships and offer a renewed focus on modernising Welsh manufacturing with an emphasis on creating green jobs". Mrs Hart and Mr Lewis were also campaigning on economic matters. On a visit to the Ford plant in Bridgend, Mrs Hart said Wales had depended "for too long" on a "grant culture". She said the assembly government's door would "always be open" to help home grown or international firms "bring and maintain quality jobs in Wales". But Mrs Hart, currently health minister, warned she was "not interested in a revolving door policy where a company takes the best we have to offer only to move on, taking high quality jobs with them". "Firms who wish to do business with Wales will have to sign up as full members of the Welsh social partnership approach for the long term." She said this involved "committing themselves to good employment practices, ensuring that staff have opportunities to keep skills up-to-date and meeting our principles of environmental sustainability and corporate responsibility". Mrs Hart said the commitment of Airbus, Ford, Corus and the energy industry in Pembrokeshire to Wales demonstrated it was a "small, clever country ready to do business". She pledged Wales would "continue to buy into" firms prepared to "guarantee to buy into our communities for the long run". Mr Lewis toured the Corus steel works at Margam in Port Talbot and emphasised the need to save jobs and get the economy "back on track". He said he would "create a social partnership in Wales", bringing together "business, trade unions and education leaders". Together, Mr Lewis said, they would construct "new policy" which would "utilise all of Wales' talents and experience". "Building on successful social democratic models from across Europe and beyond, this kind of partnership offers leaders in civic society a role in genuinely transforming the way day-to-day politics is run, giving politics in Wales a new unity of purpose." He said he wanted to "change the way Wales works - from government down to the shop floor - to ensure we improve competitiveness and grow the private sector whilst addressing work-life balance". Describing achieving both equality and efficiency as "the holy grail of Welsh politics in the 21st Century", he insisted that "these should not, cannot be, competing aims if we want to make Wales an exciting place to live and work".